It’s been a while since I’ve baked a dessert. I used to bake often. But, as it turns out, baking every other day isn’t really conducive to a healthy lifestyle. However, there are times when the impulse to bake something sweet and chocolatey is all too consuming. And as usual, my urge to bake last night wasn’t fully my idea. Ned had requested that I bake something, which, quite frankly, was all the arm-twisting I needed! I had initially set out to make a chocolate molten lava cake. But, as I scrolled a through a few recipes for ideas, I quickly realized that any lava cake would take more butter than I was willing to bake with. So, there went that idea. After a quick assessment of healthier ingredients, I came up with this. I am really happy with the way it came out. Especially, since I’d not baked in a while and was more or less making it up as I went along. 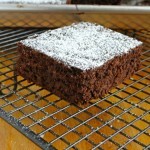 The crumb of these brownies isn’t the dense fudge-like consistency of other brownies I make. But, it is rich, dense and indulgent without being overly sweet! The thing that I’m most proud of is that these brownies are made without butter or oil! The fat comes from coconut milk, which I had leftover after making some creamy avocado-coconut popsicles. From start to finish this only took me 30 minutes to make- about 10 minutes to prepare and 20 minutes to bake. You could enjoy this straight out of the oven with your favorite ice cream if you choose. The only thing I insist on is that you use full-fat coconut milk in this recipe. Don’t bother with low-fat coconut milk, which I find is typically just full-fat coconut milk with water added. Meanwhile, prepare a quarter-sheet baking tray or 9 x 12 cake pan with a light covering of oil and dust with cocoa powder. In a medium-sized mixing bowl sift together the whole-wheat flour, cocoa powder, baking powder and salt. Then set the dry mixture aside. Next, in a separate mixing bowl whisk together the eggs, coconut milk, vanilla extract and sugar until well combined. Then, add the wet ingredients to the dry ingredients and mix with a spatula until the ingredients are well combined. Then, carefully pour the batter into the prepared pan and spread the batter as evenly as possible using a spatula. It will be thick but the mixture will cover the pan. 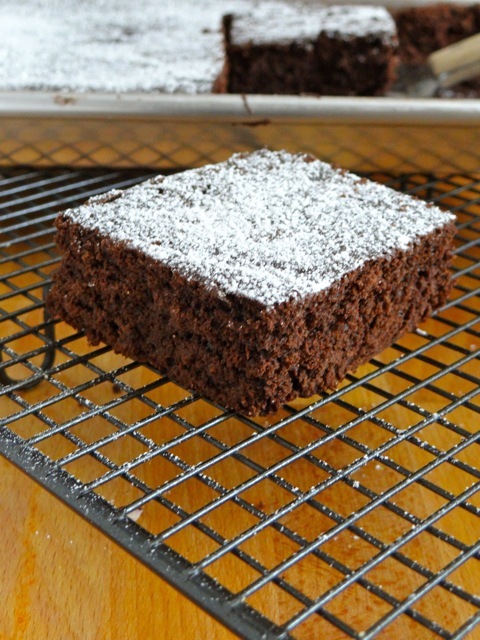 Bake in the center rack of the oven for 20-25 minutes, or until a cake tester when inserted in the center of the brownies comes out with very few damp crumbs on it. Remove from the oven and allow to cool to room temperature or enjoy warm. Sprinkle with powdered sugar if desired.